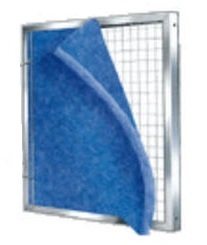 View our selection of permanent metal air filter frames with replaceable poly pads. Each precision made frame is made from durable heavy gauge aluminum channel. An expanded metal backer provides strength for many years of service. These custom furnace filters and air conditioner air filters can be sized to fit into an equipment filter slot, or into a filter back grille in the wall or ceiling. Each frame is supplied with (6) orange and white poly pads. The pads are "tacky" on the orange side to keep finer dust particles from escaping. Replacing your air conditioner filter or furnace filter on a regular schedule will reduce energy costs and extend equipment life, as well as reducing repair costs. 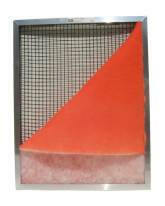 You only purchase the metal air filter frame once. After that, you only need to purchase the replacement air filter pads.